The Cromarty Suite – written by Corrina Hewat, Mary Macmaster and Patsy Seddon was performed at the 2014 Harp Village in Cromarty. It has been purposefully written for a wide range of players, from recent beginners through to advanced, so all participants will have an important part to play in creating the music. The piece is wholly inspired by Cromarty, mainly the connection with Sir Thomas Urquhart, Hugh Miller and the Emigration Stone. For harp ensemble with 4 or more harps. The Cromarty Suite – written by Corrina Hewat, Mary Macmaster and Patsy Seddon was performed at the 2014 Harp Village in Cromarty. It has been purposefully written for a wide range of players, from recent beginners through to advanced, so all participants will have an important part to play in creating the music. The piece is wholly inspired by Cromarty, mainly the connection with Sir Thomas Urquhart, Hugh Miller and the Emigration Stone. The Cromba Air (Cromba is the Gaelic word for Cromarty meaning crooked bay) is a beautiful and spacious tune and serves as an introduction and welcome to the whole suite. That is followed by Mary’s 2 tunes, the first inspired by the works and writings of Sir Thomas Urquhart, first Laird of Cromarty and is called ‘Translating Rabelais’ The second tune is a slow air with the sorrowful title of ‘Remembering the Cromarty Firth from a London Jail’ which formed a part of Sir Thomas’ life story. Then it is into Patsy’s tune inspired by Hugh Miller, and is simply called Hugh Miller with the subtitle ‘breaking open the stones on the Cromarty beach to expose the fossils inside’. The sound of chipping can be heard in this cheery slow reel. But it has a reminder that the very last stone that Hugh Miller cut in Cromarty was a gravestone for his young daughter. Following that, Corrina’s tune is a dance in 3/4 and 3/8 called ’39 Ships Long Since Gone’ and is inspired initially by the Emigration Stone in Cromarty which has the name of all the ships that left Cromarty for the New World. The piece incorporates joy and sadness thinking about Cromarty Bay being the last place the emigrants would have seen before leaving for their new lives in Canada or Australia. The whole suite is then finished off with the Cromba March echoing back to the first piece and one which all 3 musicians wrote together. It is uplifting and is a happy triumph over adversity and hardship kind of tune. It’s a fitting end to the musical story of Cromarty. 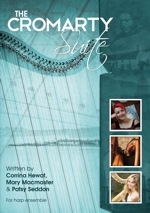 The Cromarty Suite has now been published as a music book with all the parts for harp players and has been written for 4 ability levels of harp playing so that you can choose which one suits you best. 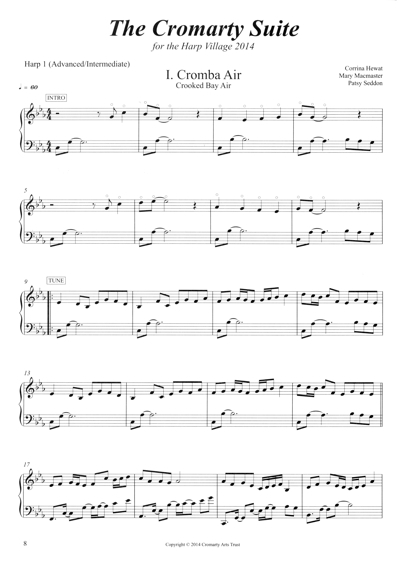 Whether you're a recent beginner, an elementary student, an intermediate player or advanced player, you will enjoy learning this beautiful score.